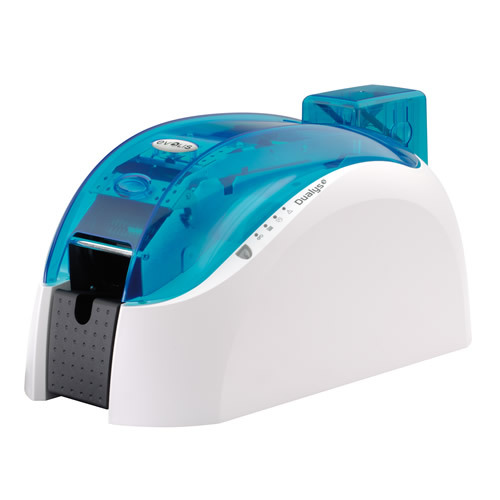 ** NOTE ** THE EVOLIS DUALYS 3 PRINTER IS NOT GUARANTEED COMPATIBLE WITH MICROSOFT WINDOWS 10. A RECENT MICROSOFT UPDATE IMPLEMENTED A STRICT REQUIREMENT OF DIGITAL SIGNING OF DEVICE DRIVERS. THERE IS A BETA DRIVER AVAILABLE FROM EVOLIS BUT IT IS NOT SUPPORTED OR GUARANTEED. AS THIS PRINTER MODEL WAS DISCONTINUED IN 2012, NONE WILL BE FORTHCOMING. IN OTHER WORDS, IF YOU DON'T HAVE A WINDOWS 7 OR XP PC AVAILABLE, THIS MAY NOT BE THE PRINTER FOR YOU. A reliable dual-side printer with top-notch performance, the Dualys 3 guarantees fast personalization of cards by the unit and can also issue personalized cards in volume. This printer is in good condition and has been used moderately (4265 prints). With this printer you have the perfect solution to personalize your cards at anytime. To determine if this refurbished printer matches your individual needs, please call SafeCard ID toll-free at +1 888.485.4696 for a free consultation with one of our experts.